Great Graphic Novels for Tweens! The tween years, ages 9 to 11, can be a challenging age when it comes to finding appropriate reading materials. These kids may devour Harry Potter, but they might not be mature enough to handle The Hunger Games or Divergent. The same is true for graphic novels. Beyond Diary of Wimpy Kid, Bone, Dork Diaries or Big Nate, graphic novels can be gritty, violent and sometimes sexual. Like much of adolescence, graphic novels for this age group can be an awkward fit. But great tween graphic novels are out there, and can meet the needs of even the most discerning reader. Here are a few with inventive plots, vivid settings, mythical creatures and heroic, fully realized characters. And of course, these books have gorgeous illustrations. Because why else would a kid want to read a graphic novel? — The Last Unicorn is lyrical story about the last unicorn in the world, adapted from the novel by Peter S. Beagle. The illustrations are lush — like a dream spread on the pages of a book. — Doug TenNapel’s Tommysaurus Rex tells the story of Eli, and his discovery of a full-grown, friendly dinosaur in a cave. What kid hasn’t fantasized about having a dinosaur as a pet? — In Ben Hatke’s Zita the Space Girl, Zita must rescue her best friend in outer space who has been kidnapped by aliens. — In Dan Santat’s Sidekicks, a dog, a hamster and a chameleon develop superpowers and battle it out with each other to be a superhero’s sidekick. — Who would have thought that a cardboard box would make the best birthday gift ever? Doug TenNapel did in his imaginative story, Cardboard. — Rapunzel’s Revenge is Doug and Sharon Hale’s hilarious twist on an old tale. The heroine enters the wild west and teams up with Jack (from the beanstalk). The magic continues in Calamity Jack, the second book. — Talking animals find evidence that humans once inhabited the world in the futuristic and imaginative The Travels Thelonious by Susan Schade. — Six orphans escape their orphanage and travel to an uninhabited moon in A. J. Lieberman and Darren Rawling’s The Silver Six. 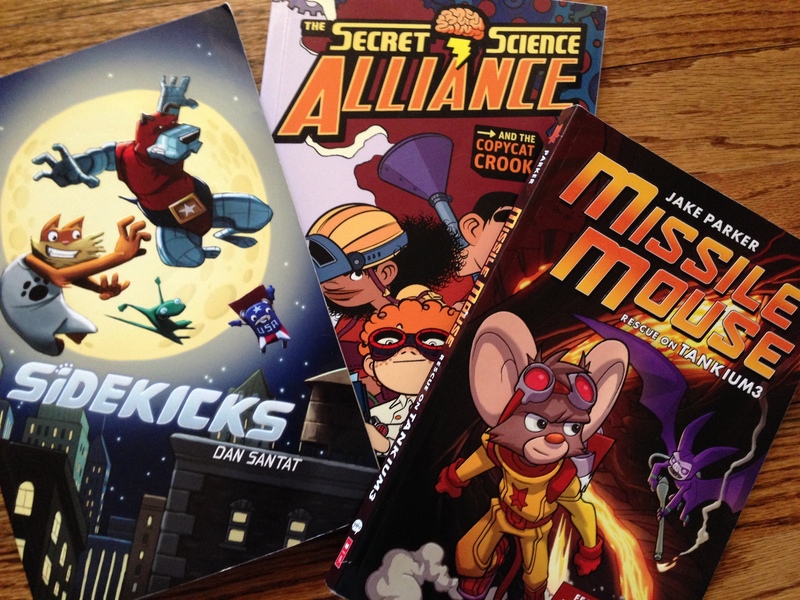 — If the kids in your life loved the Geronimo Stilton series, they’ll appreciate the extraterrestrial adventures of Jake Parker’s Missile Mouse as he saves the universe. — Readers who love technology will relate to the inventors in Eleanor Davis’ The Secret Science Alliance, who use their gadgets to outwit an evil scientist. — Poisonous frog warriors defend Amphibilands against the spider queen and an army of scorpions in Trevor Pryce and Joel Naftali’s An Army of Frogs. — The Encyclopedia of Early Earth is Isabel Greenberg’s epic tale about gods, monsters, mad kings and medicine men, which follows the journey of a young man from the north to the south pole.